Is the Hay house in Macon, Georgia haunted? 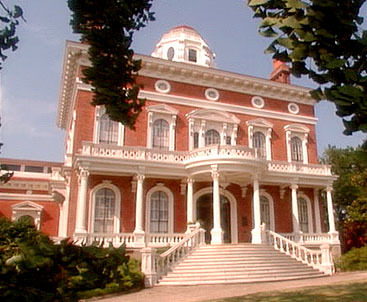 The Hay house was built in 1859 and became a National Historic Landmark in 1974. The house has seen several owners up until 1962, when it was converted into a museum. In 1977 the home was donated to the Georgia Trust for Historic Preservation, which runs the home as a museum, education and cultural event center as well as a tourist attraction. It remains as such to this day. There have been many reports of hauntings by employees and visitors alike, one of the most common is that of seeing the apparition of an elderly woman dressed in a gown of the mid 1800's fashion roaming the hallways, who she is however remains a mystery. Other reports include unexplained cold spots on the stairs, footsteps in empty hallways, doors being slammed shut on their own and the feeling of someone breathing over your shoulder. The other common report is to hear the sound of moaning comming from the master bedroom. There is a story of how one of the residents of the house died from an illness within the room, their identity though, is difficult to uncover. Could this be the elderly lady seen stalking the halls?